Its yet another. Can you please help the needy? You can trust the source as its from my good friend Ganesh who has originated the request. Also you may have a look at the image attached. Ms. Ramalakshmi was our junior (National Engineering College, 2005 batch - CSE Department). Her mother is suffering from Brain Tumor. Please extend your help. And also forward it to the friends you are in touch with. I have personally enquired the genuineness of the mail and all the details given are true. Please extend your help. Hope every one are doing fine. I am writing this for our friend Ramalakshmi who was with us in CSE dept. Her mother (Latha illayaperumal) suffered from Brain tumor. She underwent a surgery at Apollo hospital, Theynampet. But after the surgery her condition became worse. She is in unconscious stage for the past 45 days and continues to be in ICU with artificial breathing. She had already spent around 10 lakh. 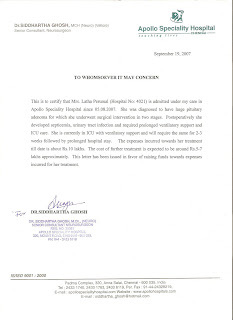 It is advised by the doctor that her mother has to be in ICU for another 3,4 weeks which may cost another 4 to 5 lakhs. She needs our help for this. Please help her as much as you can. Our small help will cost her a lot & may bring her mother back…. Please find attached the doctor's letter regarding the patient. To read the same in tamil, please read my friend Rasikow's blog here. Here is the doctor's letter for your perusal. Hope all of you are doing good and enjoying your life to the possible extent. After sometime, i am meeting you all with a request to help for education. Please let all your buddies aware of this and let them know the contact details. As usual, i am always reachable in my mobile +91-98809-61616 and through my email Raghavan dot 30May1981 at gmail dot com. I can represent the people by collecting the funds from individuals and send the consolidated amount to the needy. Please read the mail chain for further details. We just need around 10k more. I need to complete this chapter by today. Thanks for all whoever supported for this. Will send you detailed mail with contribution list @ end. This is for a noble cause to help for a needy person in Madurai. I have forwarded a detailed mail from my friend who is anchoring to help him from his sources. We are trying to get him financial support from the banks but we are already too late to join the college. We got some 2 days time from the Principal. So we planned to collect money from our known sources & help him to get into the college now. In a month of time we should be able to return your money. You can trust me for your money. I am collecting from my friends & going to give to him today. Pls let me know @ the earliest if you are interested to help him. So far my score is just 5k. P.S: Ashok pls forward this mail to our helpinghearts06@yahoogroups.com since my new id is not registered. Thanks for your earlier support for our Educational Support effort. Currently Muruganadam completed his B.E., (Production) from NIT-Trichy and working for Bajaj Auto, Pune. He arranged Rs.8000/- through his network and helped gayathri to pursue her College. Currently we need to mobilise for these two persons hailing from very poor background from remote villages in Tamil Nadu. 1.Karthick, Mechanical Engg (Self Supporting), Thiagarajar College of Engg, Madurai. He had contacted me very late. He got admission in Thiagarajar College of Engineering, Madurai this year for Mechanical Engineering (Self Supporting). He never know whereabouts of his father and his mother is dump and deaf. She is working as a daily wages in a rice mill. This boy hails from a village near Karaikudi. Extremely poor even for the day to day survival. With all his constraints, he secured 456/500 in 10th Std and with the available teaching facilities he secured 1008/1200 and got admission into TCE Madurai. If he would've contacted us earlier we could've guided him to take Anna University and arranged him for a bank loan and scholarship. Currently, he need to pay Rs.62,350.00. This boy with his known local teacher tried all the banks for educational loan and none of them had helped him anyway. Currently, we got extention for reporting for admission in the college till 30th August, 2007. I have enclosed all the details in the attachments. We are also trying to organise through private loans/bank loans to meet the deadline. She also hails from very poor background. We had already supported her last year. TCS Dina knows very well. This year she needs Rs.15,000. Our beneficiary Murugananadam from Bajaj Auto Pune arranged Rs.8000.00 and she needs further 7000 for her course. She also secured very good marks in +2 and she is very much interested in becoming Teacher. Hence, she took this course. As you all aware about our rules. You can contribute Rs.500 or Rs.1000 or any amount of our choice. Please call me and do the best at the earliest from your end. Kindly let me know your contribution so that I can consolidate and speed up the process. Please spare a few minutes of yours. Its a genuine case for saving a 4 yr old boy named Santhosh. The necessary documents are produced in this blog. See at the bottom. The request letter from his father Shankar Babu is in the mail content. Please try to help a person who is struggling to save his son. I kindly request you to please forward this to your friends (you can forward the link of this blog) circle as well so that some of them might help without your knowledge. For any details or queries, you can contact me @ Raghavan dot 30May1981 at gmail dot com. I have already collected some amount and if some of you would also join, we can send the consolidated amount to the needy. 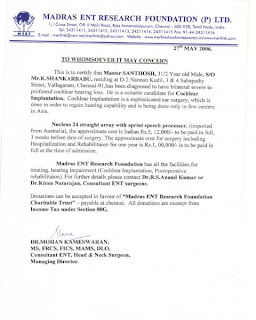 If you wish and you can, you may please directly send your contributions to the Madras ENT Research Foundation as mentioned in ShankarBabu's mail. Thanks a lot for your kindliness. Still Rs.4,00,000 is needed for the surgery. I am tryine my best & keeping my fingers crossed for any positive turn-around to happen soon. Pls keep my son Santhosh in your prayers & I hope he can gain the hearing ability soon. 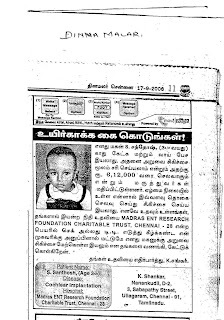 For your information, Cheque or DD can be given in favor of Madras ENT research foundation charitable trust A/c S.Santhosh, Chennai.Donations are exempted under Sec 80 G of IT ACT. I have received your mail through one of my other friends as well in my other gmail Id. I have forwarded to my friends circle and the funds collection is in progress. Surely i can collect as much as i can and definitely send it as you have suggested. My Best Wishes and Prayers for Santhosh to get recovered soon. I am pleased to introduce my self as K.Shankarbabu residing at 40/41, Raghava Nagar, 2nd street, Madipakkam, Chennai – 600 091. I am working as a driver in Arjunan Travels, Madipakkam, Chennai and earning Rs.3000 per month, which is not sufficient to meet even the daily needs. My son Master.S.Santhosh, aged 4 years has been diagnosed to have profound hearing loss right from the birth. He is getting treatment at Madras ENT Research Foundation (P) Ltd.,Chennai. He has to undergo cochlear implantation – a sophisticated ear surgery as soon as possible to regain his hearing ability. This sophisticated ear surgery is being done only in a few centers in Asia and costs about Rs.6,12,000. The date for the surgery has been tentatively fixed in the later half of this year – 2007. The certificate issued by Dr.Mohan Kameswaran (Madras ENT Research Foundation) is attached herewith for your reference. I am the only earning member in my family and my son S.Santhosh has already undergone heart surgery at the age of 3 months at Egmore Children's hospital, Chennai. In this situation I am unable to meet the necessary medical expenses. I humbly request your good self to kindly look into this matter and arrange for necessary medical aid for my son at the earliest. Donations can be made in favor of Madras ENT research foundation charitable trust A/c S.Santhosh , Chennai. Donations are exempted under Sec 80 G of IT ACT. The attached documents are as follows. Though the caption is given in tamizh[meaning-> "lets help as much as we can"], the contents and future blogs will be in english so as to reach every1. I know we have to make use of (and we are really making use of) the advancements in today's Science and technology for various purposes. But still at times we feel happy and proud of ourselves when we do spare a few minutes of ours for others! This is the blog yielding/seeking such an opportunity. This blog is for my friend Saravana (who is known to me through my friend G Karthik known as GK). I have edited the contents sent by Saravana for the precise reach. Please bear with me for the lengthy blog as it may be providing the full details and validity! Next mail from him upon our request to provide further info..
Bank: ICICI Bank, Mount Road Branch, Chennai. As of now, through God's grace and other friends support they were able to do the surgery in time and his would-be is fine. But still they are in need of the payments towards post medical surgery which is still about 1 lakh. Many Thanks to all my friends who have already contributed of their affordable limits! Also for their support in forwarding the same to their friends circle! The reason for this blog is for the further need of the fund! The Helping Hands/Hearts, please do extend your valuable cooperation which will help saving a life of a human being!!! As usual, whoever is willing to contribute some amount within your affordable limits, they can either directly send it to the ICICI Account details provided above by Saravana directly! If any of you have a CITIBANK account, they can contact me through RMuthu@gmail.com I can collect the amount and give it to him! I hope you can atleast help him by just forwarding to your friends circle, which takes a few seconds! I do understand nowadays there are quite a few mails of similar type being sent nowadays. But still for the ppl who are in need and critical situation, we can help to an extent by safely landing in our own limits rite? Every1's little contribution can definitely make a big contribution for the needy. Any one can contact him through email or phone for sort of authentication/verification towards this before helping him. Thanks to almighty for having helped him to get the surgery done in time and keeping his fiance in good health and spirits. ஏதோ பிறந்தோம், ஏதோ வாழ்ந்தோம் என்றிருப்பதல்ல வாழ்க்கை! எப்படி வாழ்ந்தோம் என்பதும் ஒரு அங்கம். வாழக் கிடைத்த வாழ்க்கையில், ஒரு சிலருக்காவது வசந்தத்தின் முகவரியை அறிமுகம் செய்தோமேயானால் அதுவே வசீகரத்தின் வனப்பைக் கூட்டும்!